You need nerves of steel and a penchant for adventure if you want to drive round Belgrade in your own or a rented car. Belgraders as a rule drive fast and irritably, they change lanes abruptly without signalling, and swear viciously at everybody on the road, because nearly everyone thinks they are always right and therefore entitled to the right of way. If you decide to drive round Belgrade after all, do pay attention to the following: observe the rules and ignore whoever is hooting the horn because you did not move forward the second the traffic lights turned amber or because you drive within the speed limit. Bear in mind that the speed limit in the city is set at 50 km/h, unless otherwise specified by speed signs. The police monitor speed at a number of locations in the city (particularly when there is a 40km/h speed limit imposed on a section of a road). Children under 12 years of age or persons under the influence of alcohol may not ride in the front seat of a passenger vehicle. You must not drive with a blood alcohol level of more than 0,03%. Drivers and passengers travelling in the front seat must wear seat belts. As a result of a surprisingly small number of bridges, a motorway running almost through the centre of the city and the fact that a bypass is still under construction, there are no classic peak traffic periods, and instead, there are traffic jams on major interchanges almost all the day round. Whenever it rains, traffic jams and tailbacks seem to be 3-4 times as bad as those on regular days, although the number of vehicles involved in the traffic remains the same. Driving bumper to bumper for a long time and a subsequent lapse in concentration often lead to minor collisions on Gazela Bridge, Brankov Bridge, Bulevar Vojvode Mišića Street (near Belgrade Fair). The only way to avoid this is to keep safe distance. A yellow line which marks the rightmost lane means the lane is reserved for public transport and taxis. To ensure a comfortable ride round Belgrade, the best idea might be to use an ATV to negotiate the many and varied potholes in the road surface which have an uncanny way of appearing in even recently repaired roads. Potholes are the most treacherous after rains, when they are full of water and hard to see, giving many an unsuspecting driver a violent jolt. No matter how calm and composed you may be, prepare to lose control if you come across the public service handling road maintenance. This municipal service demonstrates a somewhat baffling conviction that white paint for lane markings on the road is best applied during rush-hour. They also labour under the belief that once the old asphalt layer is removed from the road surface, it should be left like that for at least a month before it is replaced with a new one. This invariably leads to further snarl-ups. The company providing road maintenance has yet to employ someone who can place manholes so that their covers are flush with the surrounding road surface. Riding over sunken manhole covers is a rattling experience that can shake kidney stones loose. For all that’s been said, the greatest peril to drivers are the pretty and scantily clad Belgrade girls passing by. Summers are the worst, but even in wintertime a stray lock of hair hiding blue eyes may cause irreparable damage. Some taxi operators in Belgrade exhibit a precarious combination of reckless driving and bad attitude. This is why we will recommend only two taxi companies (out of about twenty out there on the streets) that on the whole can boast fairly good service, reliable drivers and quite decent vehicles: Lux taxi, Tel: +381113033-123 and Pink taxi, +381119803. You can hail a taxi from the street by holding out your hand, pick it up at a taxi rank, or order it by phone or a text message (at no extra charge). A problem may arise with short trips (e.g. from Terazije to Slavija). The first taxi in a queue at a taxi rank would typically be reluctant to take a short fare, so you might try to approach a taxi at the back of the queue. If you get refused for a short journey (which incidentally is illegal), try another taxi. By all means steer clear of the taxi ranks at the Central Railway Station and Belgrade Bus Station, at Terazije near Knez Mihailova Street, and the unofficial taxi rank across the National Theatre at Republic Square. These spots are reserved for taxi sharks. A genuine taxi has final letters TX on the vehicle registration plates and must carry a roof sign stating the name of its taxi company (taxis with a white roof sign bearing only the word 'TAXI', are "free-lancers" and some of them are regular sharpers). Inside the taxi, the price list and ID card of the driver must be in clear view. The fares are metered and not subject to negotiations. Taxi fare in Belgrade is cheaper than in most European countries. There is a start-up fee of 1,5€, and the rate per kilometer is 60 cents to 1€ (depending on the type of tariff). Tariff 1 applies during Monday to Saturday between 6 and 22 and Tariff 2 either during Monday to Saturday between 22 and 6, or at any time during Sunday or a public holiday. There is also Tariff 3, applicable to the rides outside the city limits. A ride from the airport to anywhere in the city centre costs 1.800 dinars (around 15€) with the voucher scheme. You can get a taxi voucher at the baggage claim area. There is no extra charge for the luggage. A tip is not mandatory, but is appreciated, so you may round the payment up to the nearest 50 or 100 dinars. Pets are transported with driver’s consent. A driver must give a receipt for the fare, if asked. 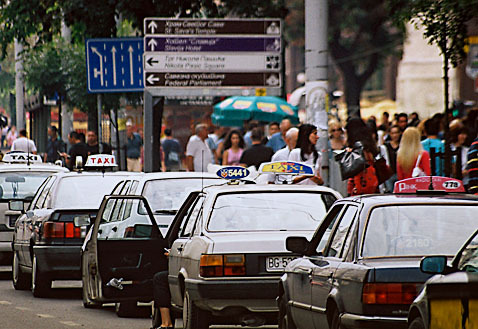 Apart from taking the scenic route, there are two common taxi scams to be wary of in Belgrade. One is charging by the meter, but setting it to the wrong tariff to raise the fare (the price of fare increases significantly when Tariff 3 is applied). The first field to the left on the taximeter shows the tariff code, and if you cannot see it properly - walk away. Another scam is to install a device that accelerates the meter’s pace, activated by pressing a hidden button. The taximeter shows the right tariff code, but the meter ticks faster than it should and the price soars. Anyhow, you should be all right if you hire a taxi from one of the two recommended taxi companies. Belgraders sometimes like to sit next to the taxi driver and have a chat. Most cabbies are happy to converse on a wide range of subjects and proffer their opinion about hotels, bars, or indeed anything you may want to know about the city. If your driver is a smoker, simply ask him to extinguish the cigarette or request a non-smoking vehicle. 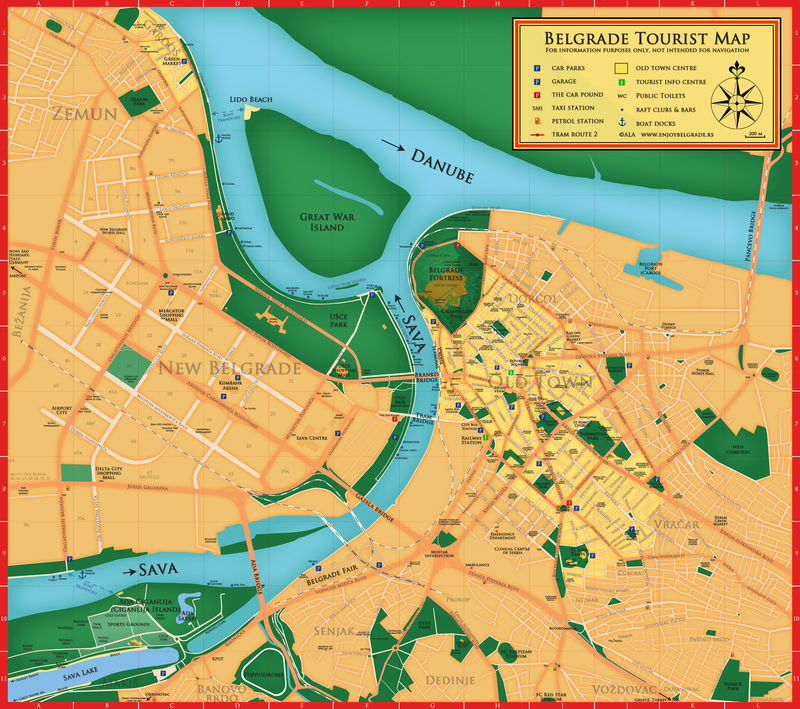 Major taxi ranks are marked on our map of Belgrade. Belgrade is best explored strolling round the city, following its sounds and scents, feeling the life of the street. Belgrade is very safe and while there are no parts of the city you need avoid, there are other hazards that a tourist unaccustomed to living in Belgrade should be mindful of. First of all, be mindful of Belgrade drivers at zebra crossings - although not exactly aiming at unsuspecting pedestrians, they are deeply reluctant to yield way. To reach the other side, you need to fix the approaching driver with a steely gaze, be bold and determinate - drivers will respect that. Then, there are the landmines left by dogs on the pavement. In theory, irresponsible dog owners should be fined for this, but it does not happen. The most dangerous landmine zones are Svetogorska, Vlajkovićeva, Palmotićeva and Hilandarska Streets, and Dorćol area between Vasina and Cara Dušana Streets. Watching where you step is also a good way to avoid falling into open manholes (some of our citizens in scrap metal business steal a manhole cover from time to time as part of their waste collecting operations). You would be unwise, however, to keep your eyes trained on the ground, because you also need to watch out for the bits and pieces falling off the crumbling façades, and the lovely icicles hanging from the rooftops can be truly lethal in wintertime, when the snow begins to thaw. In summer, you may get sprayed by dripping air conditioners (believe it or not, there is an anti-drip law). There are lots of stray dogs in Belgrade. They normally go about their own business and leave people alone. However, they may give you trouble if you decide to take a shortcut through a lonely patch of ground claimed by a pack of strays as their territory, particularly if you are afraid of dogs. So, stay alert - living in Belgrade is quite an adventure! Belgrade is a busy city and parking in the centre can be difficult. There is a shortage of public car parks, and most commercial buildings in the centre cannot boast their own parking facilities. As a result of this challenging situation, Belgrade centre has been split into three parking zones where different time limits and tariffs apply. A sign at the entrance to the street or at the crossroads indicates the parking zone. Additionally, on-street parking bays are marked in appropriate colours: red, yellow or green. Parking time in Red Zone (Zone 1) is limited to one hour, and is charged 56 dinars*. You can leave your vehicle for up to two hours in Yellow Zone (Zone 2 - the rate is 48 dinars per hour) and up to three hours in Green Zone (Zone 3 - 41 dinars per hour). To pay for your parking you need to purchase a coupon for the appropriate zone at a kiosk (often unavailable), scratch out the date and time when you leave your vehicle and display it in the windscreen or on the dashboard. You can also pay for parking using mobile phone, by sending an SMS message which contains the number plate (drop all spaces or dashes from the number plate e.g. BG100TW) to 9111 for Red Zone, 9112 for Yellow Zone, 9113 for Green Zone. The actual payment is then done via the mobile phone bill. You will receive a message in confirmation of your payment (if the SMS auto-reply says "U Beogradu…" everything is fine, but if it starts with "Zao nam je..." then the system is temporarily down and you either need to resend the message or use a coupon). Note that wardens can issue a ticket for incorrectly paid parking (if you have sent the SMS to a wrong number). You will receive an SMS reminder fifteen minutes before your parking session runs out. You must move your car before expiry of paid for time, and you must not leave it in the same parking zone for the next 30 minutes. If you overrun your paid for time, you will probably find a parking ticket tucked under your windshield wiper. So, be back on time as wardens have zero tolerance for those who arrive late. There are ticket-happy wardens who actually lie in wait for the chance to issue people with a fine the second their parking time expires. The parking fine of 1870 dinars* is paid at a post office or a bank (additional source of annoyance). On-street parking is charged Monday to Friday (7-21), and on Saturdays (7-14). Beyond those hours, you can leave your car in on-street parking bays free of charge. Do not leave your car in parking bays that are clearly marked for use of companies, diplomats or the disabled. If you do, you may be towed away. Using car parks is often preferable to on-street parking, because no time limits apply and you do not have to stress about overstaying your welcome in a timed bay. All car parks are pay on foot. Press for a ticket at the entrance barrier and take it with you. Before you return to your car, feed it into one of the pay stations located within the car park and it will tell you how much you owe. The machine accepts coins and smaller notes, so you must pay at the cashier if you only have large notes. * At the time of writing the euro is worth 121 dinars. Parking zones, public car parks, petrol stations open 24/7 and impound lots for towed vehicles are marked on our map of Belgrade. Roadside Assistance AMSS - Automobile and Motorcycle Association of Serbia, Tel: 1987 (information about traffic, roadside assistance). With a population of around 1,5 million, Belgrade has its fair share of traffic jams, but no underground to ease the strain on the capital's road network. 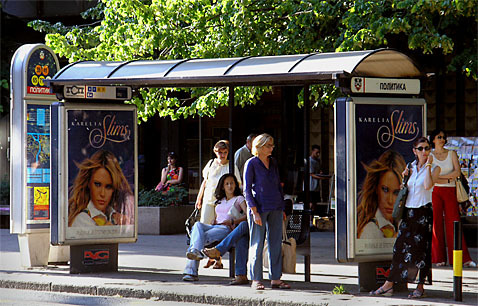 The public transportation comprises busses, trams and trolleybuses. Buses are operated by a public utilities company controlled by the city council and a number of private carriers, which accounts for the varied assortment of colours, shapes and ages of the vehicles out on the streets. Tickets are in the form of BusPlus smart cards, available at most newsagents’. Although called BusPlus, they are valid on trams as well. The tourists who intend to make a lot of use of public transport, the best thing may be to purchase 1-day (320 RSD, valid 24 hours), 3-day (760 RSD) or 5-day (1140 dinars) cards. Do note that these tickets begin to run from the moment of purchase, not the first validation. Each time you get on board, you need to touch your BusPlus card on the reader installed by every door. Also note that day tickets are not valid on nighttime rides, between midnight and 4am, and you will have to buy a special nighttime fare. If you wish to get to know the city on foot but a sudden downpour convinces you to hop on a bus, you can purchase a single-ride ticket directly from the driver by paying cash, at the price of 150 dinars. Prepare the exact fare. Fare dodgers risk a penalty fare of 3,000 dinars. Currently there are ticket inspectors operating continuously on most lines of public transport, so do not forget to validate your card or buy it from the driver. Public transport runs (roughly) from 04:30 to 23:30 hrs. During night time, buses run at 1-hour intervals from 00:10 to 02:10. Only cash fares are applicable at night, available on board at the price of 150 dinars (Zone 1). Night buses depart from special stops at the Republic Square towards other parts of the city. Although pick-pocketing is far from rife in Belgrade, be careful and alert in public transport, particularly when you are packed like sardines. A tram ride can be fairly exotic as old trams can sway like ships in rough seas, and one broken tram blocks the entire line (which typically happens right in the middle of two stops, in a pouring rain). A ride on tram No 2, which circles round the old town, is an excellent budget option for a sightseeing tour of Belgrade. In old town, a bus may prove to be faster than a car, because most streets have bus only lanes. Belgrade public transport is generally efficient, but for the occasional bizarre situation such as: waiting more than half an hour for a bus that in theory runs every 5 minutes, to see as many as 4-5 busses on the same route arrive all bunched together; riding with a driver eager to finish his shift, speeding, taking incredible chances on sharp bends, and generally driving like Ben Hur; with the added excitement if the particular driver needs to call his wife to say that he’ll be home for dinner, and is overtaking holding a mobile in his hand. It’s never a dull day in Belgrade. Cyclist have a hard time weaving through the old town because they must share the road with other vehicles, but there are dedicated bicycle paths along the river, from Dorćol to Ada Ciganlija, which are truly enjoyable. There are bicycle service shops and nice resting places at several spots along the way. Good routes for riding a bike include those at Ada Ciganlija, the quay along the Sava in New Belgrade, and Zemun Quay. There is an escalator for cyclists at Branko’s Bridge near the passenger terminal, allowing for a smooth transit from New Belgrade to the path leading from from Dorćol to Ada Ciganlija (and vice versa). Riding a bike in Košutnjak is not recommended because of steep hills and narrow traffic lanes used by cars (although there is a wild cycling trail descending through the forest from Košutnjak to Topčider Park which is sheer pleasure for the experienced cyclists). There are many well-marked cycle lanes and paths in New Belgrade, but hardly anyone abides by the markings. You will often see pedestrians walking on designated cycle paths (they are made of new, red asphalt, which pedestrians swear is easier on the feet), and some cyclist prefer to ride on the carriageway, just out of habit. In addition to reckless drivers, cyclists need to be ware of stray dogs. Two or three strays chasing cars and barking enthusiastically should be warning enough - chances are they will take interest in a lonely cyclist.